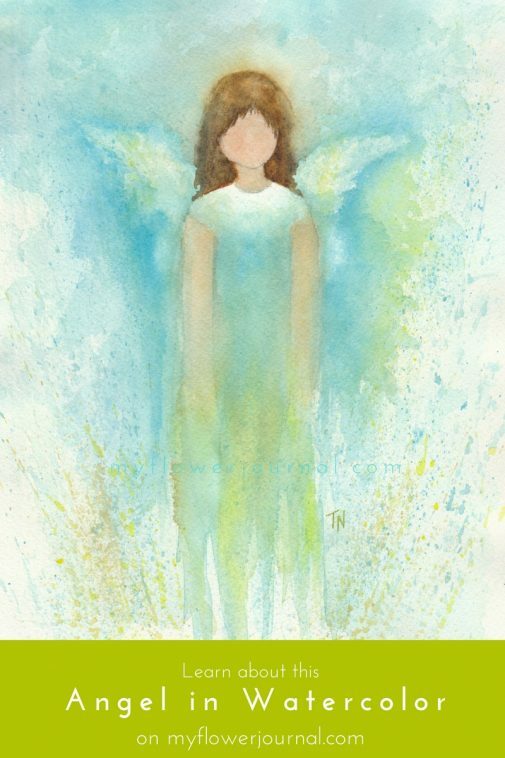 A friend recently challenged me to paint an angel in watercolor. This was a bit out of my comfort zone. Painting flowers is what I usually do. Once I started painting my angel I couldn’t stop. 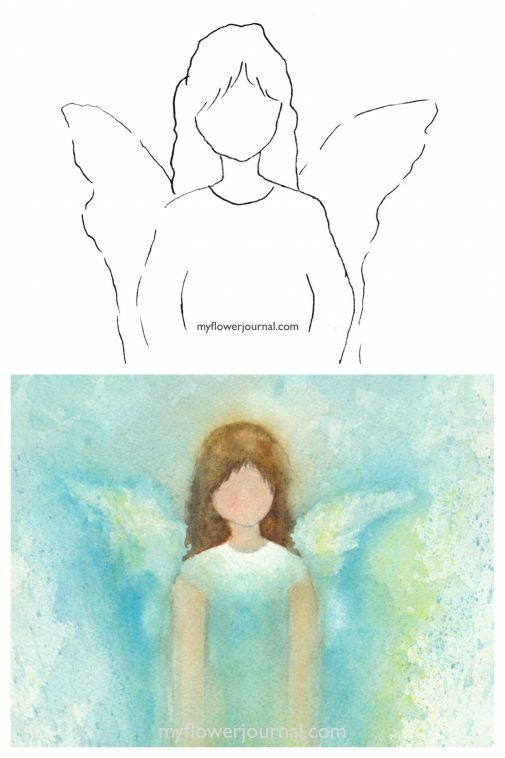 So I don’t have any step by step photos for you, but I decided to still share a little of my process with you.I hope this will inspire you to use your creative energy and paint your own angel in watercolor. I was pleasantly surprised how much I have enjoyed my little angel. I may be painting more angels, but until then I hope this one will brighten your day. First I sketched this simple angle in my sketchbook. Then I made a copy of it and placed it on my light box and lightly traced it onto my 8×10 piece of watercolor paper. I kept my sketch simple because I wanted it to feel like my angel was emerging out from the watercolor. The next step was to wet my paper and add washes of yellow and blue and a mix of colors for her arms. I did not wet the area where her face is so I could add the flesh color later. I let the colors run and drip at the bottom. I tried not to mess with this area too much. After the paint dried I went back in and added details and lots of splatters to create texture in the background. I had to stop before I worked on it too much. I love how the colors and textures came together to her a give it a bit of an abstract look. May you always have angels watching over you! Why don’t you sell prints of your art I would love to see this on a flag. Wow! She is beautiful! I am just starting watercolors. Your angel is an inspiration to me. She has given me some ideas for playing with my new birthday watercolors! Thanks Rasz. Enjoy your new watercolors! Etherial! Tammy, this is just lovely. Cant wait to try this. Thank you for inspiration and sharing. Let me know how your angel turns out! This is so simple yet so ethereal! Love it. Thank you so much for sharing your projects with us :-). Have a Blessed Day!